In Zimbabwe, many hospitals are ill-equipped and there is a shortage of doctors and healthcare workers. Because of this, thousands of pregnant women and new babies die every year. Since 2011, we've been providing hospitals with better equipment, as well as training health workers to deliver the urgent care that so many mothers and babies urgently need. In Zimbabwe, many hospitals are ill-equipped and there is a shortage of doctors and healthcare workers. Because of this, thousands of pregnant women and new babies die every year. Our programme, launched in 2011, aims to address this challenge. Working with the Ministry of Health and Child Welfare, Ark's goal is to ensure Zimbabwe's pregnant women and newborns have access to a trained and equipped health worker. By the end of 2015, we will ensure all 62 district hospitals are staffed by a Clinical Officer with the skills needed to deliver comprehensive emergency obstetric and neonatal care. This initiative alone is expected to reduce mortality rates by 25 per cent over the next three years. To ensure we save lives now, we are also running an intensive, four-day course in emergency obstetric care coupled with regular follow-up sessions for existing health workers in 24 districts. Alongside and in partnership with UNICEF, we have introduced newborn care corners in 20 district hospitals; dedicated areas equipped with cost-effective, life-saving equipment which prevent lack of oxygen at birth and other preventable causes of death in newborns. Our ‘newborn care corners’ have been installed in 20 Zimbabwean hospitals, providing staff with cost-effective equipment to help babies survive potentially fatal conditions. The initiative covers all the equipment needed to save babies' lives, as well as a two-day training course for health workers. 100 health workers in the 20 district hospitals we are supporting have already been trained and will be provided with on-the-job, follow-up training over the coming year. None of the equipment in the care corners is expensive or complicated - it just needs to be on hand when complications at birth arise. We will be monitoring the impact of the intervention on newborn mortality over the next 12 months. Zimbabwe needs more and better trained health workers to reduce the unnecessary deaths of mothers and babies. To ensure we have an immediate, sustainable impact on survival rates, we are training existing health workers in 24 districts. Eight hundred health workers will undergo a four-day course in basic emergency obstetric and neonatal care over the next 18 months. The training takes place in the maternity wards, so that health workers gain immediate, practical experience in how to spot and address complications at birth. We’re also training frontline health workers to spot danger signs and refer pregnant women for specialist care. We are accelerating the Ministry of Health and Child Welfare's programme, which currently trains 10 Clinical Officers a year. With Ark's support, 80 Clinical Officers will be trained over the next two years to ensure, by 2015, all districts in the country have a health worker with the skills needed to save lives. The majority of the practical, two-year training course will take place at Chitungwiza Hospital, just outside Harare, where Ark has built a dedicated training centre and student accommodation. Students will also train at Harare's central hospitals and, crucially, must complete an attachment in rural areas to gain firsthand experience of the work they will face as qualified Clinical Officers. All students are committed to working in rural district hospitals after graduation. From 2014, we will also train 60 Nurse Anaesthetists to work alongside the Clinical Officers. This 12-month intensive course is for existing nurses who have years of experience but do not have the qualifications needed to ensure safe surgeries for pregnant women with complications. Four trainers will be trained within each district, equipping them with the skills to train more health workers, ensuring quality of care is maintained when Ark exits. 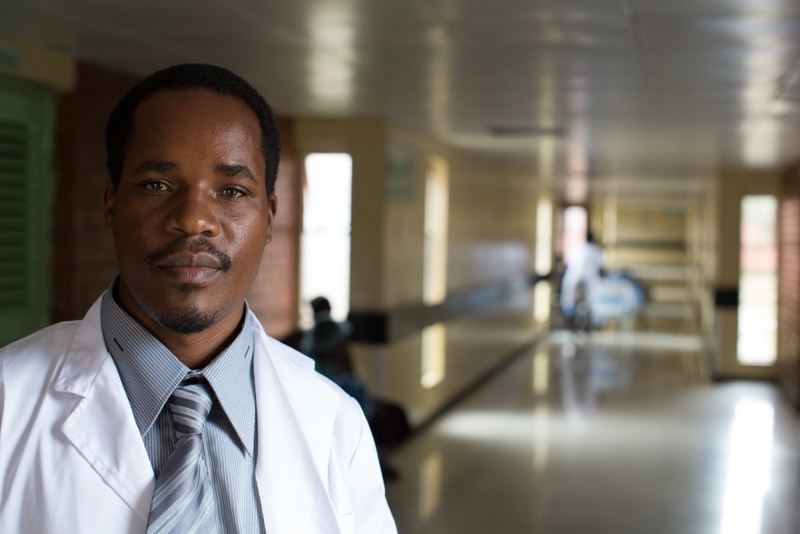 Itai is studying at Chitungwiza Hospital, where we’ve built a dedicated training centre and student accommodation. He recognises the shortage of qualified doctors in rural Zimbabwe, and says that mothers and babies are dying because they are referred to hospital too late.